Okay, I may have exaggerated a bit. 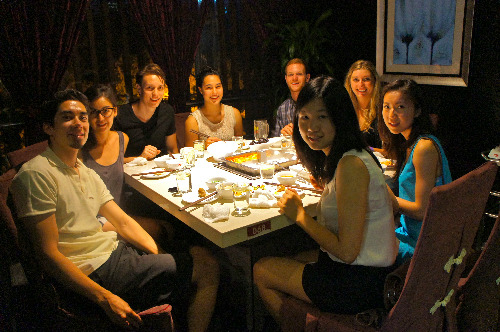 But what’s a better way to welcome MCO’s new summer interns to China than a cozy night with hot pot? 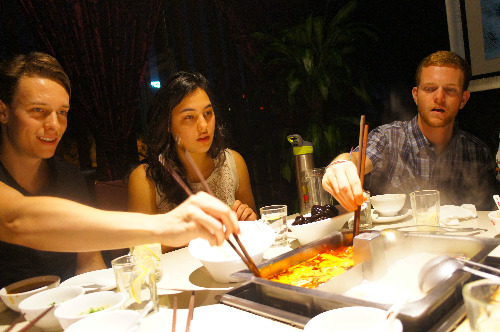 This past Saturday we had a welcome dinner for the new interns at Hai Di Lao, a wildly popular hot pot chain famous for its five star service, unlimited free snacks, and Kung-Fu-style “noodle dance”. Chris asked a waitress to show us around the kitchen. Apparently this was something you could just ask for here at Hai Di Lao. Isn’t it reassuring to know what your dishes look like when you are ordering? It was a great challenge for the new arrivals to put meat and vegetables that they couldn’t even name into their bowls; luckily, our interns are an adventurous group.